This year marks the 40th year of Skylab’s descent back to Earth and its impact on the Esperance region. To recognise this anniversary, the Esperance Museum is hosting a program of activities in the lead up to the anniversary on 12 July for the community to get involved in. Skylab was America’s first space station and the world’s first big space station. It was orbiting unmanned for just over five years before it returned to Earth breaking up and scattering debris across the Esperance region in 1979. Skylab crashing back to Earth is one of our most memorable events for our community that has a significant international connection. Do you have a passion for fashion? Do you love designing? 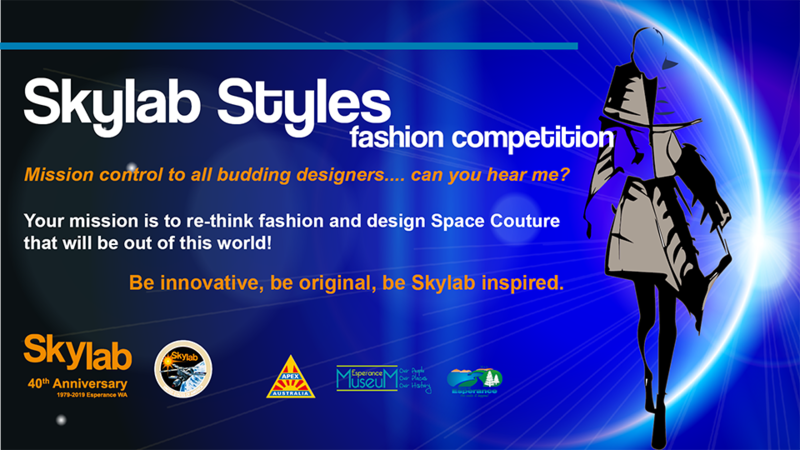 Be innovative, be original, be Skylab inspired. Your mission is to re-think fashion and design Space Couture that will be out of this world! Use as much recycled materials as possible in your creation. Let your imagination explore the possibilities of what you might see in space. Entry is open to anyone in the Esperance region. Registrations close on 31 May 2019. Join us at the Skylab Styles Welcome Workshop on Thursday 2nd May, 5:30pm at the Museum. Come along to get some hints and tips on creating your fashion garment. Full competition terms and condition here. This year marks the 40th anniversary of Skylab falling back to Earth. Some say that it sounded like a sonic boom and others say it looked like fireworks. Skylab crashing back to Earth is one of our most memorable events for our community that has a significant international connection. 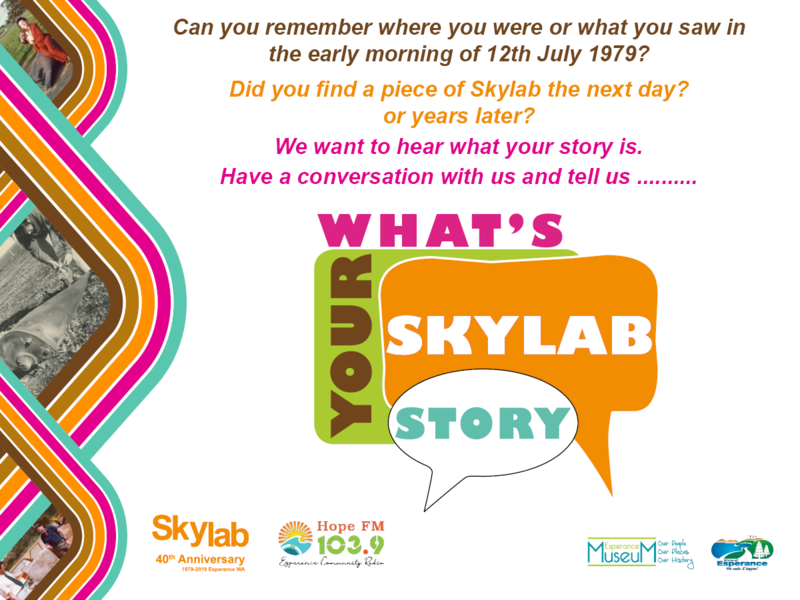 Community Radio Station 103.9 HopeFM is partnering with Esperance Museum to help capture stories from our community about Skylab. • Call Meredith Waters on 0481 053 328 from 103.9 HopeFM and book in a time to have a conversation. • Bookings can be made for Mondays, Tuesdays and Wednesdays. Please note: all conversations will be recorded for the Museum Archives and participants will be asked to sign an agreement form for copyright. Did you know that Skylab could be considered the largest single recycling project ever, as the station itself was made from leftover Saturn 5 and Apollo hardware components. What’s out there? Think outside of this world, get creative and use recycled materials to create something unique. Be creative, be original and let your imagination run free. Create a model, collage or poster about Skylab, or our Solar System, or space travel or what you think you might see in space! The potential is endless! You must self source your recycled materials. Your entry must be from 100% recycled materials. Competition is open to all primary and secondary students in the Esperance region and closes at the end of June. Download the entry form with all the details here. The Esperance Museum is partnering with the Shire of Esperance Waste and Recycling department for this competition. If you have any questions regarding this competition, please contact Georgia Ryan on 9071 0610.